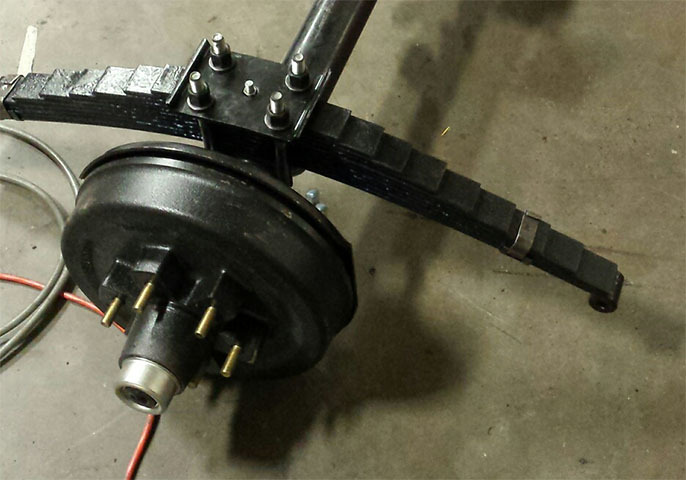 Airstream Axle Replacement - Silver bullet trailer inc.
Axle with drums and brakes is the main component connecting your trailer with the road. It is of paramount importance that your trailer's axle is in good shape to provide proper amortization for a smooth ride. Airstream used two types of axles for travel trailers. Originally it was leaf spring axle, and in late 50s it was changed to Dexter-made torsion axle. At first torsion axles were welded on to the frame, but later Airstream started to bolt axles to the stiffening plates, which were welded on to the frame. Depending on the year and model of the trailer, Airstream used different size and different load capacity axles. On average, the lifespan of a properly performing torsion axle is 20 to 30 years. A good indication of the need of a new axle is if the torsion arm is pointing to the ground when looking from the rear of the trailer to the front. We use original Dexter axles as a new advanced replacement for tired and worn-out ones. Please contact us if your trailer might benefit from an axle replacement.